The Hinnom Valley as it is seen today, otherwise Gehenna. Technically speaking, Gehenna is the "[...] valley of Hinnom, a place near Jerusalem where children were sacrificed to Baal (reference Jeremiah 19:6-7)" (OED 1916). The Jewish Encyclopedia informs further that Gehenna is the "Name of the valley to the south and south-west of Jerusalem (Joshua 15:8, 17:16, Nehemiah 11:30, 2 Kings 23:10; 2 Chronicles 33:6; Jeremiah 7:31 et seq., Jeremiah 19:2, 32:35). Its modern name is "Wadi al-Rababah." The southwestern gate of the city, overlooking the valley, came to be known as "the gate of the valley." The valley was notorious for the worship of Moloch carried on there (comp. Jeremiah 2:23). According to Jeremiah 7:31 et seq., Jeremiah 19:6 et seq., it was to be turned into a place of burial; hence "the accursed valley Ge-hinnom" ("Gehenna" in the New Testament) came to be synonymous with a place of punishment, and thus with hell (comp. Isaiah 66:24; Enoch 26: et seq. ; and the rabbinical Hebrew equivalent)" (The Jewish Encyclopedia 1906). The pagan deity of Molech was worshipped at the Hinnom Valley. 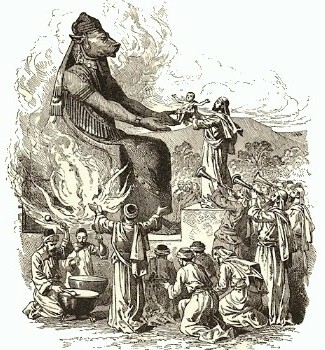 Concerning the pagan rituals of infanticide, the Encyclopedia Britannica informs that "This practice was carried out by the Israelites during the reigns of King Solomon in the 10th century bc and King Manasseh in the 7th Century BCE and continued until the Babylonian Exile in the 6th Century BCE. Gehenna later was made a garbage centre to discourage a reintroduction of such sacrifices" (The Encyclopedia Britannica 2016). This pagan practice remained so vivid within the social subconscious of the ancient Israeli society that centuries later, the heinous practice paved the way to eschatological viewpoints held today among many Bible enthusiasts. The Encyclopedia Britannica continues to say, "The imagery of the burning of humans supplied the concept of “hellfire” to Jewish and Christian eschatology. Mentioned several times in the New Testament (e.g., Matthew, Mark, Luke, and James) as a place in which fire will destroy the wicked, it also is noted in the Talmud, a compendium of Jewish law, lore, and commentary, as a place of purification, after which one is released from further torture" (The Encyclopedia Britannica 2016).